Vienna International Airport was founded in 1938. Leafing through the pages of history would reveal that it was used as a military airport. In 1954, Vienna Airport became Austria’s first privately managed airport. Vienna Airport is one of the few in Europe that is listed in the stock exchange. With two runways, among other features, it is the most important airport in Austria. In 2016, it handled around 226,000 flights a year and 23.4 million passengers. The numbers of 2016 represent the typical usage profile of the airport in recent years. With such a large number of people using it, a fully functioning air conditioning system is critical to the success of the airport. The airport is home to a large number of lamellar/fin heat exchangers in the air conditioning system, as shown in Figure 1. 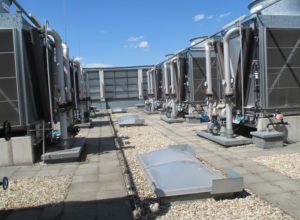 Owing to years of service, the external heat exchangers – totalling 10 in number and occupying a space of 400 square metres – had become highly contaminated with dust, especially cement, lime and gypsum dust, due to the surrounding industrial environment. The situation severely impacted the cooling performance. Such pollution causes energy costs to rise rapidly by 10-30%, or more. Also, the corrosion caused by contamination can lead to a significant reduction in the service life of the heat exchangers. The airport had carried out several cleaning attempts of the heat exchangers but largely had been unsuccessful; and, in some cases, the attempts had caused more damage than good. For instance, through a cleaning trial with chemicals, the dust had become hard as cement, and the lamellas/fins had started to corrode due to chemical reactions. In May 2017, mycon and its sister company, Kipp Umwelttechnik undertook the task of cleaning the heat exchangers. They applied a combination of “JetMaster” system with three other devices. The result was that a significant amount of residue was removed from the heat exchangers. The cleaning exercise was so effective that the through-value of the heat exchangers almost returned to a new state. Technology, in cooperation with a university, and offers considerable advantages, such as high cleaning quality, and cost effective and environmentally friendly nature. JetMaster works exclusively with compressed air and a small volume of normal water (drinking water quality). 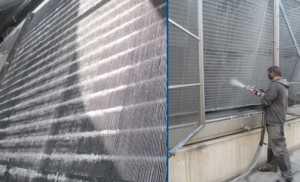 Compared to cleaning with a high-pressure cleaning instrument, the advantages are obvious: Less water consumption, more gentle cleaning without damaging the sensitive lamella/fins and greater cleaning level. A cavitation effect ensures a high cleaning efficiency in less time. By not using chemical additives, there is no additional burden for the cleaning personnel and the environment.